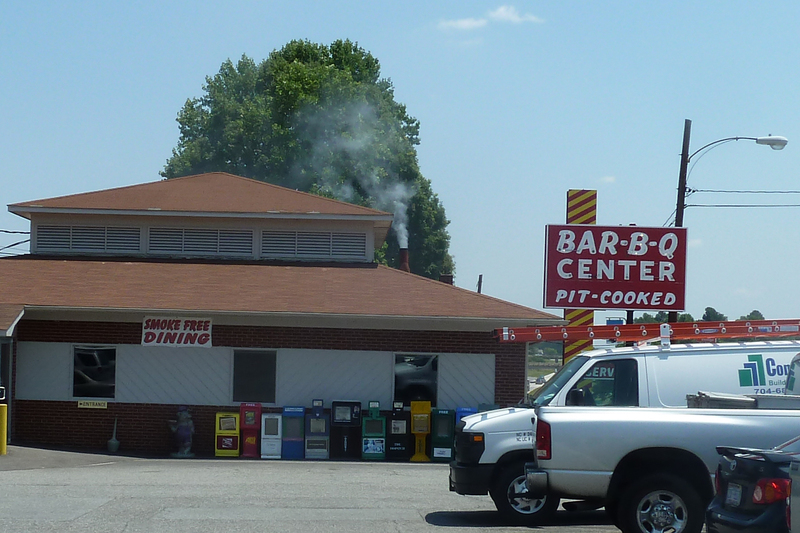 In case you need further explanation, the Bar-B-Q Center is one of the state’s oldest (and best) barbecue joints and still cooks the pork in traditional wood pits, despite the state imposed ban on smoking in the dining room. Praise be indeed. Hours: Mon-Sat 10:30 a.m. to 9:00 p.m. Despite the tendency of customers to have strong opinions about who makes the best barbecue, most barbecue restaurants in North Carolina are quite modest and humble. 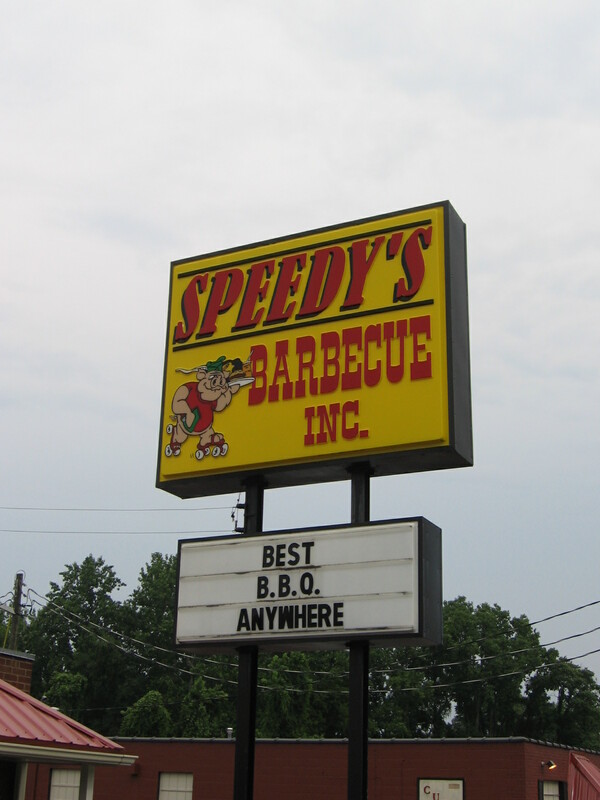 When I visited Speedy’s Barbecue, the sign outside the restaurant read, “Best B.B.Q. Anywhere.” As I set foot inside Speedy’s I wondered to myself whether the hyperbole on the sign (not to mention the needless periods in “BBQ”) was a good omen or a bad one. It turns out that Speedy’s is neither the best BBQ anywhere nor completely unworthy of such a claim. I found their barbecue to be far better than average, but not quite as good as some other joints in the barbecue Mecca of Lexington. The fact that one of the superior joints, Smiley’s, is located within a few blocks of Speedy’s is irrelevant but amusing. The other notable part of Speedy’s sign is the demented looking pig in roller skates and a t-shirt (and pantless as far as I can surmise). This is easily one of the better barbecue logos, as it mixes humor with a nod to Speedy’s motto: “Quality, Quantity and Quick Service.” (The skates are also a nod to the joint’s long tradition of providing curb service.) Speedy’s prides itself on those three Qs and delivered all of them on my visit. Others must agree that Speedy’s provides those three Qs, as the place draws a large crowd. Even at the early hour of 5:00 p.m. on a Saturday when I visited,the joint was jumping… to the extent that a bunch of mostly olders folks eating chopped pork can be called jumping. 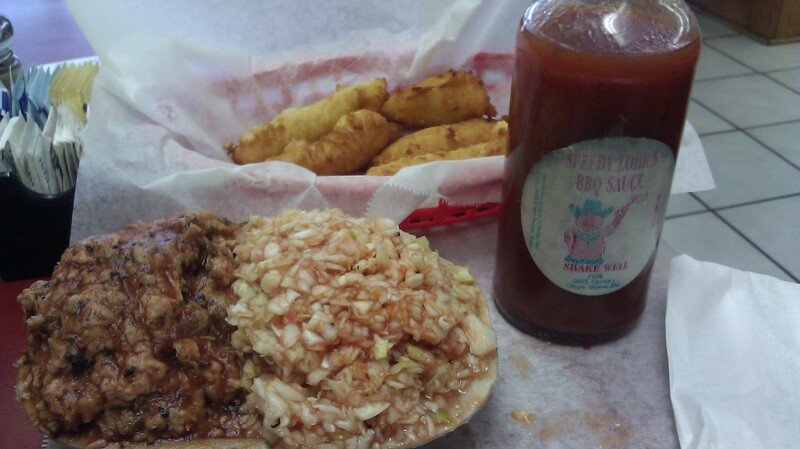 The barbecue at Speedy’s is good. Not calm down and take a cold shower good but good nonetheless. 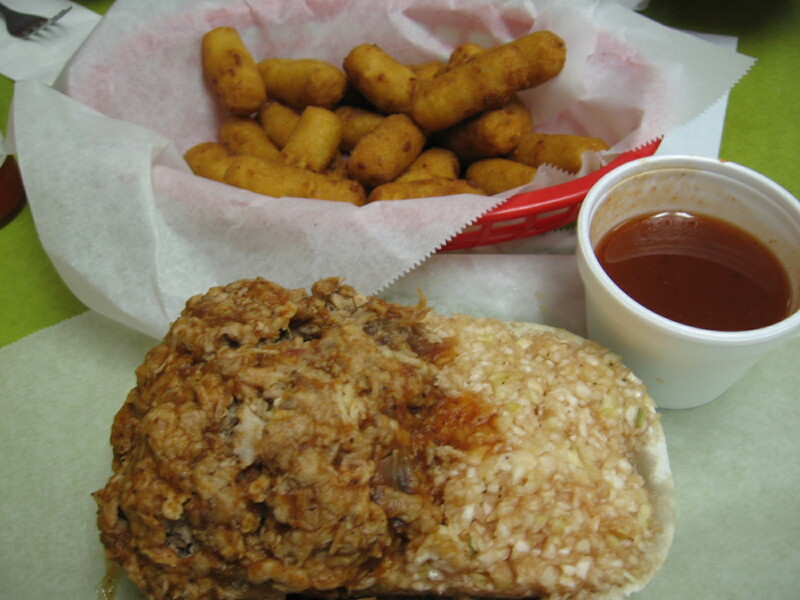 The tender and almost too-moist ‘cue is served with dip provided in a cup on the side, as is common but not universal for Lexington-style joints. I found Speedy’s dip a little ketchupy for my palate, which tilts toward straight vinegar and pepper flakes, but the dip typifies the style in this part of the state so it’s not a fair critique. Quality, Quantity and Quick Service indeed. Accompanying the pork were tasty, dense/firm puppies and classic Lexington-style BBQ slaw (cabbage sauced with modified dip and completely mayo-free). I enjoyed my meal and found Speedy’s lived up to its three Qs, if not it’s claim to serve the best BBQ anywhere. One major caveat: I have it on good authority that their pork is not cooked in a wood-burning pit. It’s pretty good nonetheless, but something short of traditional barbecue.